Thursday, 10/6: 9 a.m. – 10 a.m. / 3 – 6:00 p.m.
Friday 10/7: 9 a.m. – 10 a.m. / 3 – 6:00 p.m.
All classes will visit the Book Fair on Tuesday and Wednesday to make a wish list. Parents, please review their choices! See the flyer to learn more about the books. You can even preorder the next Diary of a Wimpy Kid book! Visitors must check in at the office first during school hours. Come to the PTA Meeting/Ice Cream Social on Tuesday, October 4, 7PM. 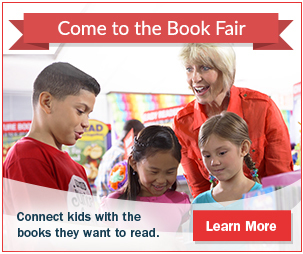 The Book Fair will be open from 7:00 to 8:30 p.m.
For small orders, children may purchase books during the school day. You may send in cash or a check with a phone number. NOTE: there is no sales tax. Larger orders should be purchased by an adult at school or online. Please do not send kids to school with blank checks or credit cards! All checks need a phone number! Visit our Online Book Fair. Create wish lists and invite friends and family to shop. There’s even an app you can download. All online orders ship for FREE to the school, after the Online Fair has ended and will be delivered to your child’s classroom. Is a book sold out at the fair? Order online! Be sure to look for your teacher’s Wish List posted at school and add a book or two to your order for their classroom library. We hope to reach $8,700 in sales and encourage thousands of hours of reading fun. Help us reach our goal and get ready for winter reading! Proceeds from past Book Fairs purchased magazine subscriptions for the school, free books to give to students, and many books for classrooms.